Sign at Value Village in Lake City says local nonprofits are paid "every time you donate." Washington State Attorney General Bob Ferguson is suing the chain, contending it is misleading consumers. Among his examples: "In reality, no money from in-store purchases ever went to charities," he wrote in a blog post. That reality is far from the image the Bellevue-based chain has promoted, according to a lawsuit filed by Washington Attorney General Bob Ferguson. He accuses the nation’s largest for-profit thrift-store chain of misrepresenting to the public the charitable benefits of their donations and purchases. The case against Value Village is currently being argued in King County Superior Court, though part of the case is now on its way to the state Court of Appeals. It is there that state prosecutors will try to beat back the company’s appeal of a partial ruling from a King County Superior Court judge. The judge allowed the attorney general to pursue the state’s claims that the company solicited for donations of all types of goods, but paid charities only for some of them and deceived consumers. Value Village and its corporate parent TVI Inc. are asking the Court of Appeals to review the judge’s ruling in part on First Amendment grounds. A hearing is scheduled for Jan. 25. But Value Village, its corporate parent Savers LLC and their ultimate corporate parent TVI Inc. are following a legal path that commercial fundraisers have previously used to ward off demands by regulators for more transparency. In negotiations with the state prior to the suit, Value Village rejected the state’s demand that it post signs in stores specifying the amounts paid to charity partners for each type of donated good, such as clothing or books or furniture, citing a 1988 Supreme Court decision in a North Carolina case. It’s one of several cases in which the U.S. Supreme Court has ruled in favor of paid solicitors who argued that charitable fundraising is a form of free speech. “This may be because Value Village’s aggressive marketing campaign misled consumers to believe that both their purchases and donations would benefit local charities,” Ferguson wrote in a column on his office’s website. “In reality, no money from in-store purchases ever went to charities,” Ferguson wrote. In Minnesota, Savers now reveals through its website the bulk rates it pays for various store items, and it reports to the state the percentage of the value that goes to charity. The company also has detailed how much it gives to charity to state regulators in a number of states including California, Colorado and Ohio. Here, Savers reported after the company registered as a commercial fundraiser in 2015 – 28 years after the state Charities Division first asked it to, according to state records obtained by InvestigateWest – that 100 percent of the “value of contributions” went to its charity clients. In December 2018 the company filed paperwork with the Washington Secretary of State’s Office amending that figure to 99 percent. This photo from InvestigateWest’s “Profiting From Thrift” series in 2015 illustrates the large markup the retailer managed to make on goods donated by the public on behalf of charity. The Washington attorney general’s suit followed publication of InvestigateWest’s “Profiting from Thrift” series in 2015 that used government records obtained under the Public Records Act to detail how state officials had for years tried but failed to force Savers and Value Village to register as a “commercial fundraiser.” That designation was designed to require Savers and Value Village to disclose to regulators what the retailer pays local “partner” charities such as the Northwest Center and Big Brothers Big Sisters, as well as how much it retains as a commercial fundraiser. The InvestigateWest stories in 2015 and 2016 established that the proportion of Savers’ revenue paid to charities is likely between 8 percent and 17 percent, based on the company’s own statements, an examination of some of the company’s contracts with charities obtained by InvestigateWest, and estimates of revenues by private business research companies. The state’s survey revealed that most consumers thought the percentage that the charity would get was at least 30 percent of the sales price. About 90 percent of those responding overestimated the amount the charity would get. The Attorney General argues that the company only changed its business practices after the State of Minnesota filed a lawsuit against the company in May 2015 and the State of Washington began investigating in December 2014. 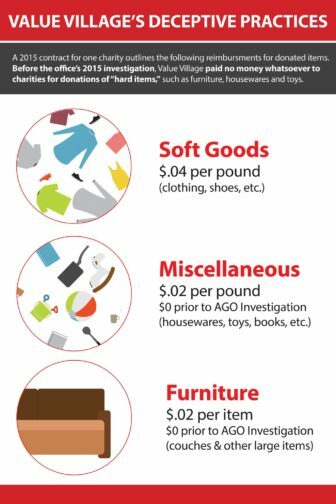 A graphic circulated on social media by the Washington State Attorney General’s Office reveals that the fancy piece of furniture you gave to Value Village’s donation center could be worth as little as 2 cents to charity. A key allegation in the Attorney General’s suit is that consumers are led to believe, through the company’s in-store ads and social media messages, that sales rung up in the store benefit charities when they do not because the charities get paid a set amount no matter how much the items sell for. Other types of donations, like those to Seattle-area charities founded by former Seattle Mariners pitcher Jamie Moyer and Washington Redskins quarterback Mark Rypien, provided less benefit to the charities than was advertised, or did not go to the organizations specified, according to the suit. As the case plays out, kindhearted Washingtonians continue to make donations at local thrift stores, dropping off used items at each Value Village store’s on-site Community Donation Center or feeding handy collection bins positioned outside. 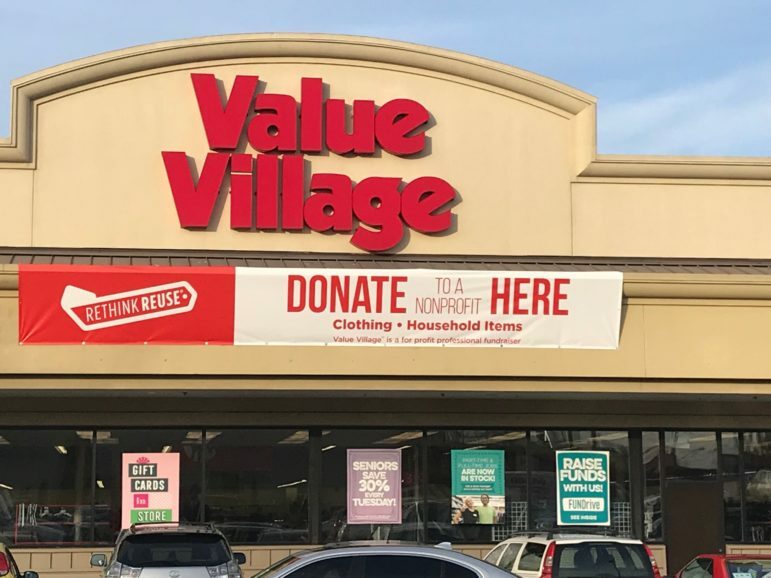 According to the state lawsuit, Value Village received millions of dollars’ worth of donations of non-cloth donations but failed to provide a benefit to charities – until the company began putting a price on them in its contracts in late 2015 and early 2016. That change happened only after the company “came under pressure from multiple state regulators, including Washington,” according to the attorney general’s office. 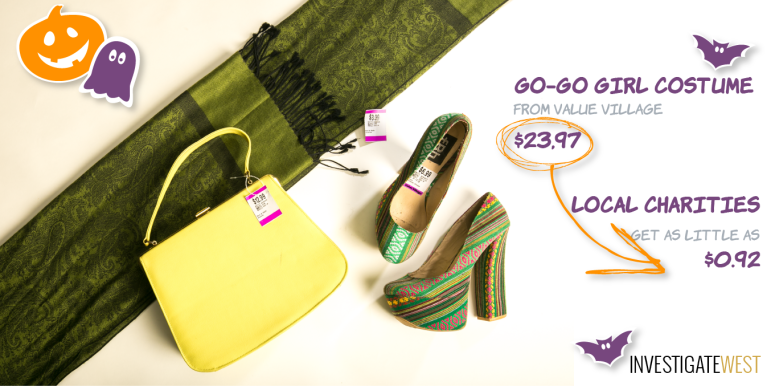 In its answer to the Attorney General’s complaint, Value Village denies that it paid nothing for the non-cloth items. Value Village says that its contracts with charities were written in such a way that the payments for clothing and other cloth items were meant to compensate the charities for the other items, the so-called “hard goods.” In fact, the charities that brought in more “hard goods” got a higher rate, the company claims, although the judge raised questions about whether that was uniformly true. Judge Chung’s reversal came after Assistant Attorney General John Nelson provided evidence of internal billing ledgers and internal emails revealing that charities were not paid for the non-cloth portion of donated goods. Nelson produced ledgers that clearly showed $00.00 being paid for “hard goods,” the judge concluded. As a result, the judge allowed the state to continue pressing its claim that Value Village has been misleading shoppers. The state’s case against Value Village hinges to a large degree on public perception based on what the state calls the overall “net impression” created by the retailer’s marketing, such as advertising, social media, charity appeals, logos and tax receipts designed to make it appear like a nonprofit instead of a for-profit company. TVI denies the state’s allegation that it misrepresents itself as a charity. The company also says that its charities state that they’ve not received complaints from people about their relationships with Value Village. It also says the company has not represented that charities are paid part of the proceeds of its sales. “Donate to a nonprofit here,” reads a banner at Value Village in Seattle’s Crown Hill neighborhood. The final line states “Value Village is a for profit professional fundraiser.” Parent company TVI denies the state’s allegation that it misrepresents itself as a charity. “The State’s claims are that for a decade … TVI was making misrepresentations … and for a decade [involving] …. what must be millions of different customers and donors, the state has not shown one [consumer] who was deceived by that practice or filed any kind of complaint,” Grant argued at the hearing. In the past, some states either required registered charities to spend a certain amount of the money they raise on programs or imposed limits on how much goes to paid fundraisers. But during the last two decades, such demands have been struck down as unconstitutional by the U.S. Supreme Court, with several cases citing fundraising as part of charities’ First Amendment free-speech protections. -“Soft goods,” such as clothing, linens, shoes and towels. -Miscellaneous “hard goods,” including jewelry, toys, books and small household items. -Furniture and other large “hard goods” items. Charities receive between 5 cents and 19 cents per pound for miscellaneous hard goods, the contracts show. The sale of large hard goods, such as tables or dressers, result in payments to charities of 2 cents to 19 cents per item, according to the contracts. However, those contracts reveal only the per-pound rate paid to each charity, rather than what percentage those donations represent in relation to Value Village’s total revenues. There is no way for consumers to know how much their donations benefit the charities from the disclosures made available to them. One charity that receives funding from Value Village is ARC of Washington State, which provides help for people with developmental and intellectual disabilities and their families. ARC director Sue Elliot said in a statement submitted in the lawsuit that her organization had considered the possibility of operating its own thrift stores but decided against the idea. Shumpert pointed out that Value Village also benefits Washington by employing 1,600 people, according to the company, and generating about $9 million per year in state and local taxes. 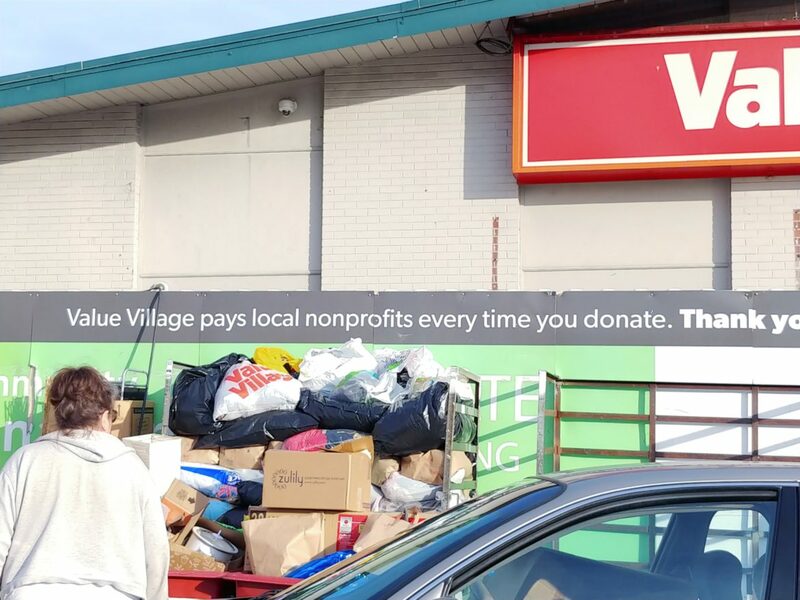 Unlike Value Village’s corporate parent, which is a private equity company, nonprofit thrift stores such as those run by the Salvation Army and St. Vincent de Paul are required to disclose their financial arrangements. Under federal rules, such charities must register as tax-exempt organizations and file a federal income tax 990 form publicly detailing much about their finances. Value Village balked, ultimately offering $700,000 — $200,000 to pay the attorney general’s costs and a $500,000 donation to a Washington State University research program on recycling waste from clothing, sheets and other cotton consumer items made from cotton. The state declined. If Value Village offered information in Washington similar to its disclosures in Minnesota, the state says, donors would be able to make smarter decisions on where to give — and help level the fundraising playing field. Under such a system, nonprofits that give a higher percentage of sales proceeds to charity may be viewed as a more attractive option, the state says. Value Village argued to the state Court of Appeals court late last month that the King County judge allowed “inadmissible evidence” – internal company documents intended by the state to show that nothing was being paid to charities for “hard goods.” Value Village also argued that the trial court ignored the “heightened burden” under the First Amendment that requires the state to prove that consumers were harmed by their business practices. The appeals court has yet to rule. At a Kenmore thrift store benefiting St. Vincent de Paul, donation attendant Micki McGuire says contributions have surged in recent months. So has the number of unusually detailed questions. This story has been corrected since its initial publication to clarify that Judge Samuel Chung’s ruling in favor of the state was procedural rather than substantive and to eliminate any reference to the First Amendment in Judge Ricardo S. Martinez’s ruling.